Would anyone who knows me be surprised to learn that I have been a vegetarian most of my life? I feel a great deal of affection for animals, and the thought of killing them to eat them feels all wrong. We wouldn’t eat our pets, would we? Add to that the reality of how brutally most animals are raised and slaughtered, and I am deeply repulsed. When I think about the cruelty of industrial farming — not to mention the environmental damage it inflicts — I feel that all-out veganism is the only ethical way to eat in modern society. Sure, there have been periods in my life when I have suppressed this awareness and eaten meat, but I have always returned to vegetarianism. Four years ago, when I was undergoing treatment for esophageal cancer, treatment that permanently altered my digestive system, and not for the better, I decided that I needed access to more foods than my strict vegetarianism allowed. I had reason to be wary of carbohydrates, and I suspected that fiber wasn’t my friend. (My gastroenterologist later confirmed that suspicion.) Also, since I was struggling to maintain weight and get adequate nutrition, I wanted access to more than noodles when I eat out. So, I compromised, and allowed myself fish and seafood. A taste of the cooked vegetable, if there is one. Then, my daughter, who was a lifelong vegetarian with a sensitive digestive system, began eating meat, saying she feels better doing so. It made me pay attention. I started struggling with my conviction that it is wrong to kill animals to eat them. Being a rather spiritually-inclined person, and a Quaker to boot, my inclination isn’t to reason this through in some sort of orderly process; I am quite certain that I could form high-quality arguments for both sides of the issue. My task as a Quaker is to discern if God is leading me one way or the other, or is it left to me to choose? Is my unease with the idea of carnivorousness a Divine leading? Or is the persistent thought that I should be eating meat a Divine nudge? Or neither? I have to confess that the I haven’t reached any clarity on this. I am not sure if my aversion to the practice of eating meat is just me or all Him. I know that spiritual authorities are also divided on the subject; eastern religion generally favors vegetarianism, while western religion is mostly indifferent. Jewish dietary laws freely permit eating meat, while focusing on practices that make it a shade less brutal and brutalizing. Christianity is pretty indifferent to the question, although the paragraphs that I have found the most helpful in grappling with this were written by the apostle Paul, in his letter to the church at Rome. Each person must be fully convinced in his own mind…. he who eats, does so for the Lord, for he gives thanks to God; and he who eats not, for the Lord he does not eat, and gives thanks to God…. I know and am convinced … that nothing is unclean in itself; but to him who thinks anything to be unclean, to him it is unclean…. But he who doubts is condemned if he eats, because his eating is not from faith; and whatever is not from faith is sin. I have to mention at this point that those of us who have had surgery for esophageal cancer are able to perform a trick with our digestive plumbing that other people can’t. With our eyes closed — indeed, while we are fully asleep — our plumbing can spray foul, caustic substances into our throat, mouth, and windpipe. This is called “bile reflux”, and can ruin your whole night. A few months ago, I had quite a bit of this going on. And I happened to notice for the first time that bile reflux appears to be gas-powered. That is, it seems that it is a rising gas bubble that blows the bile upward. Having realized that, I quickly connected that with the fact that my after-meal discomfort is always associated with a lot of bloating and burping; it involves a lot of gas, as well. As everyone knows, beans and vegetables, the staples of a vegetarian diet, cause digestive gas. So, there I was — stuck with an aversion to harming animals, a lust for eating flesh that years of vegetarianism hadn’t dulled, and a near-certainty that moving from a bean- and vegetable-based diet to a meat-based diet would leave me feeling better. I took solace in knowing that carnivorousness can’t be an affront to God, because She built it into so much of the natural world and into us. I went into Benny’s Luncheonette for a burger. I still don’t know if I am doing the right thing, I only know that I feel better much of the time. I have come to suspect that this is one of many questions that lack a right answer, and that all that is being asked of me at this time is that I remain uncomfortable with any answer I come up with. I don’t think that we are required to figure everything out satisfactorily, we just have to take these questions seriously: What does love ask of me? What does love require of me? Perhaps my discomfort arises from being stuck in the no-man’s land between what is asked and what is required; more is being asked of me than I am able to give — but we are never required to give more than we can. This is the point of faith that brings me into unity with that other Paul, and allows me to eat or to eat not, to give thanks either way, and avoid the condemnation of self-doubt. This entry was posted in Cancer, Religion & Spirituality and tagged animals, cancer, Christianity, compassion, esophageal cancer, Judaism, love, Quakers, religion, spirituality. Bookmark the permalink. I’m just glad you found something that makes you feel better, Paul! As a friend, therefore, I hope you continue to include meat in your diet. 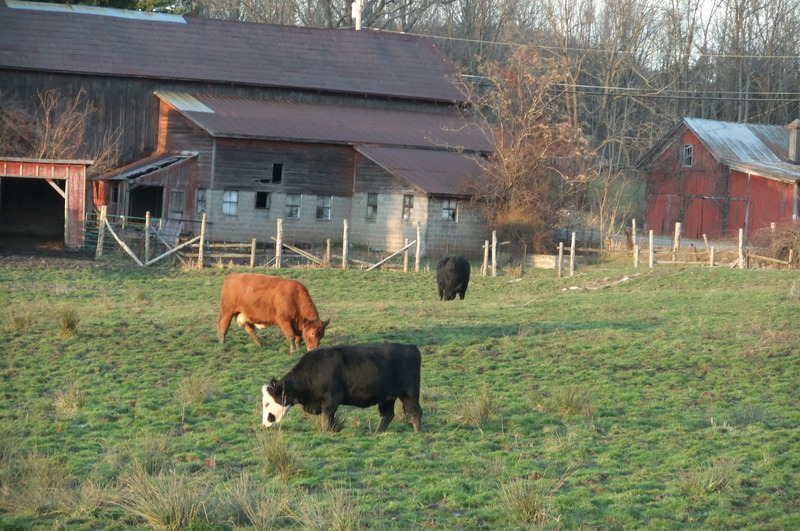 The way the animals are raised (grass-fed beef, etc.) can make a big difference, both to the way we feel about the animals’ lives, and to the ecological impact, especially in regards to beef. You probably know already that grain-fed beef has a much more negative impact than any other kind of meat. I love the way you explain your discernment process as you go–not reasonably ordered and “thought” out, but paying attention to different things along the way, including Spirit. It reminds me that linear thinking is not always the only way to get to an answer. I’m not sure that I love my discernment process here; I’m still not clear about this, and still have a feeling that I’m ducking the issue. I keep thinking about Gandhi, who was a vegan. When he was in his middle-age, he became very sick, and his doctors advised him that if he didn’t allow himself at least dairy products, he would certainly die. Gandhi replied, “I would rather die than drink milk.” He didn’t drink milk, and he didn’t die. It may just be that his doctors were wrong about it, or it may be that when we act out of pure faith, miracles happen. So, I’m sitting here typing, just had some broccoli rabe and beans (and Beano) and I’m thinking how I’m still not comfortable about eating meat, and joking with God about it: Give me a sign, oh Lord! And with that, I burb just enough bile into my throat to burn. Clearness still eludes me, but that may be the point! Patience! Allow God Her time. I was happy to read that the other Paul gave such a guilt-free comment on eating. I find myself with a different decision to make about eating. Like you, I need to keep my weight up. My condition has changed so that I am having difficulty swallowing certain foods without choking. So the choice I am faced with is whether or not to get a PEG, a percutaneous endoscopic gastrostomy, which is a feeding tube. What it amounts to is what I like to think of as a gas cap on a car that has a direct tube into my stomach. That way, in order to get enough nutrients, I can just go to the pump and say, “Fill ‘er up. I made this decision many months ago, I’m getting it. I suppose my comment has nothing to do with vegetarianism although it would be very easy to become one as long as I could get enough nutrients from all that green stuff. I commend you on making your decision so seemingly easily. Paul, as a meat eater for all of my life, I can assure you that there have been many times that I have had my conscience bother me about the need to kill the animals I consume. However, I have never doubted that it was and is God’s plan for us to eat meat. In order to reach this conclusion,one only needs to look at the teeth He gave us. The teeth in the front of our mouths are designed for tearing flesh as in all carnivores while our rear teeth are designed for grinding as in all herbivores. Ross and I have been doing a lo-carb diet for the last year. What we both noticed immediately was that not eating grains — especially wheat — really calmed down our digestive systems. We hadn’t expected that.